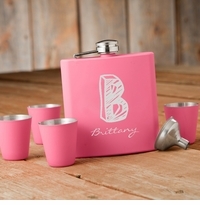 DETAILS: Our personalized Matte Pink Flask & Shot Glass Gift Box Set is a great set to throw in your purse and have a drink to share with friends at your next outing. PERSONALIZATION: 2 lines up to 15 characters per line or choose our Kate monogram and use a name up to 15 characters. MARKETING: Flasks, Mother's Day, Bridesmaid Gifts.